... and you're in! This giveaway is open until July 30. Now this is not mandatory, but it would be very nice if you would tweet me upon completion of all the steps. Good luck! love the top! the look enhance comfyness ! Oh, you've got a very pretty smile! also, thank you for your lovely comment about my sewn skirt. Wow, you look absolutely beautiful! Love your clutch! In love with your gorgeous hair and your top!!! JOIN THE CINDERELLA'S GIVEAWAY! LIMITED TIME!!! Such a pretty top! Great outfit! I like the clutch & heels of yours! you look so beautiful! i love it! omg such a beautiful top!! Hello! I'm joining your giveaway. I've liked&followed DevoteeCo ,followed your blog also twitter! Oh, you are so beautiful :) Great Outfit! :) And I really like your hair. Hello, thank you for stopping by my blog. I love the simplicity of your template. The past weeks I have been changing and adding codes to my blog and all that jazz in thought of having an all white background, I am still at it. And as for my drivers license, I passed the written so I will have to wait till August to take the driving one with an instructor! ur hair looks so pretty with this outfit! I love that peach shirt, it is very beautiful! Oh, wow! The hair, the shirt, the shoes, the cardigan, the bag...everything...it is GORGEOUS! And i must say that you're very beautiful! Nice post dear!! Thank you for commenting and visiting my blog a while ago! Like yours too! How about following each other on bloglovin and gfc? Let me know once you do, that way I’ll follow you back! Waiting for you! I like your top, it's beautiful! Would you like ti follow each other? You look stunning! :) I love the colors so much. And I want a similar clutch! Such gorgeous colours! I love the back of that top too, so cute :) great look! i love this top. it looks great on you - the colors are really perfect. and these photos are so simple and lovely. great outfit! I love your blog! Followed! Thanks for stopping by my blog and leaving such a lovely comment! your heels are great! And you are so adorable!!! Love your peach cardigan! Such a beautiful color!!! love your style.The outfits are looking so beautiful and amazing.She is looking so cute and gorgeous. 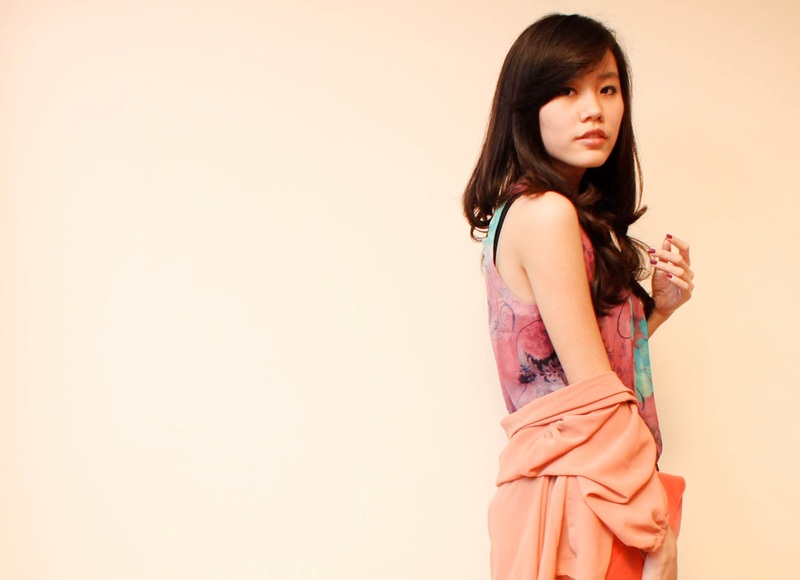 Thanks for your lovely comment on my blog dear..
such a beautiful top <33 gorgeous as always ! falling in love at the first sight! also, done all the steps! thanks for held this AMAZIN giveaway! <3<3 success! I love that top. I would totally join the giveaway if I lived in Indonesia! And you're very, very beautiful! ;) Should be a model. Look tout simplement parfait ! Btw, thx for the sweet comment!!! Wow, such elegant shots. Honestly, really lovely. Love your nail varnish & how do you get your hair like that?! hi, thank you for your comment on my blog..
you look great with that color, dear..
waaaw you look so pretty and adore your hair! again, You look fantastic, I envy You! This tangerine clutch is what I'm dreaming of all the time. + You've got just phenomenal legs! The rose top is so pretty! You look wonderful. The floral top is fantastic. Thank you for the nice comment! nice color palette. you looked stunning..
gorgeous outfitt! i love the color combo! WOW!!!! That is such a beautiful floral top!!! You look so gorgeous dear!!! Would you like to follow each other? I really like the flowy off the shoulder look. Looks great on you. I loved scrolling through your blog. You look so lovely in this post, especially your hair! Love the entire outfit and the color scheme! Nice top!! I adore the print and the back details. Thanks for visiting my blog, Nice blog you have here-your style is so chic! the tinted rose top looks rad on you! 1, 2, 3, & 4 are DONE. i just post a comment on ur giveaway page in july 22 ._.